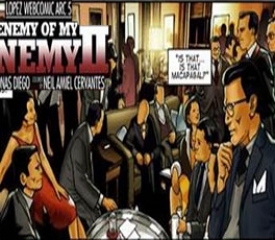 Igniting the Fallout: The Unbelievable Tactic President Marcos EnforcedA split in ideals, a clash of conflicting beliefs – in this week’s installment of Enemy of My Enemy II, business magnate Eñing Lopez Sr. is forced to take careful measures in his dealings with shady ally, president Ferdinand Marcos. 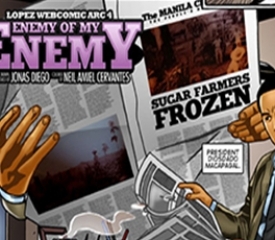 In page 4 of Arc 5 of the Eugenio at Heart Lopez webcomic, Eñing draws the line between his family and their affinity with his brother’s running mate. 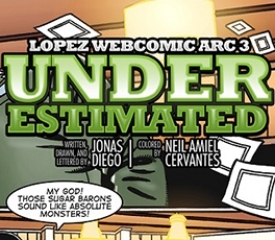 Meanwhile, Marcos is confronted with a situation that leads him to enforce a questionable move. Is this the act that ultimately ignites a full-on feud with the Lopezes? Find out the repercussions of the brewing discord and witness the aftermath of the president’s descent into the power-hungry dictator we all know him to be. 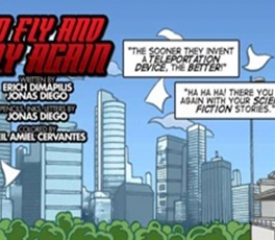 Watch the action-packed story unfold in the epic retelling of one of the most exciting chapters of Lopez history.